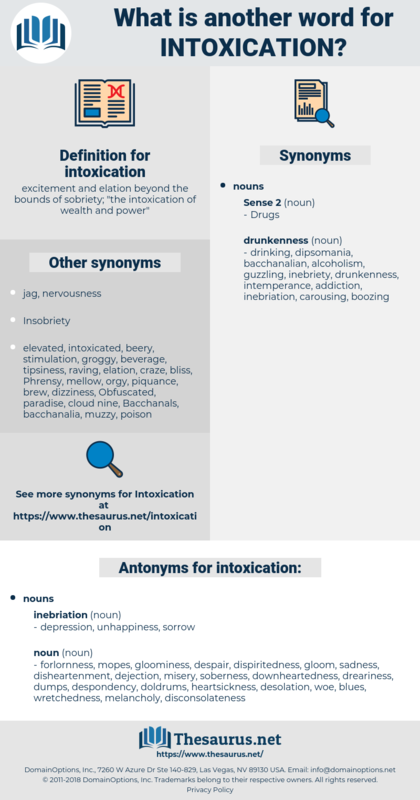 What is another word for intoxication? 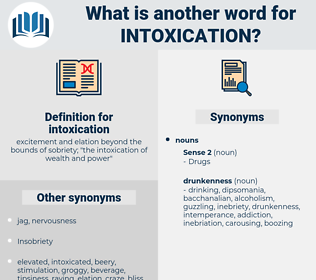 excitement and elation beyond the bounds of sobriety; " the intoxication of wealth and power"
drunkenness, exhilaration, poisoning, impairment, addiction, alcohol, drinking, drunk. forlornness, mopes, gloominess, despair, dispiritedness, gloom, sadness, disheartenment, dejection, misery, soberness, downheartedness, dreariness, dumps, despondency, doldrums, heartsickness, desolation, woe, blues, wretchedness, melancholy, disconsolateness. Any person given to intoxication would be instantly discharged. 9. The Intoxication of Noah. cyanide poisoning, caffeine intoxication, mercury poisoning, pesticide poisoning, caffeinism, nicotine poisoning, ergotism, alkali poisoning, salicylate poisoning, Paraquat Poisoning, ophidism, carbon monoxide poisoning, naphthalene poisoning.